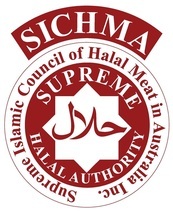 Supreme Islamic Council of Halal Meats in Australia (SICHMA) implements the Halal Certification Program with a view to ensuring that all food outlets in Australia certified as “halal” abide by the requirements of Halal standards. The restaurant, takeaway business, canteen, etc seeking halal certification must apply in writing on a prescribed application form to SICHMA. SICHMA must ensure that the applicant has provided correct trading name, ABN, address of business premises, contact address, names of owners, partners, directors and other relevant details. SICHMA will ensure that there is transparency regarding the application. SICHMA will NOT certify any food product manufacturer that uses any porcine in any of their products. ICQ will verify all purchases by sighting invoices, delivery dockets, etc to ensure that all products and raw materials. Have been purchased from outlets that in turn have been certified as halal and that all other products bought and sold by the applicant meet the halal guidelines. SICHMA will obtain from the applicant names of all its trading partners with whom it deals and/or obtains its products from. Under no circumstances a mixture of halal and non-halal food such as pork, ham, bacon, etc. will be certified halal due to high risk of cross-contamination. All ingredients such as raw materials, flavouring used in the preparation of halal product must be halal and free of alcohol. All personnel, staff and employees in the outlet engaged in the preparation must be made aware of the requirements of the Halal Certification Program and they must go through a training/induction program approved by SICHMA and the applicant. The Audit Committee appointed by the SICHMA will be responsible for the initial audit and certification of the premises. Thereafter the Auditor appointed by SICHMA will carry out periodic and random audits to ensure that the outlet complies with the halal guidelines at all times. · The Halal Certificate remains the property of SICHMA and must be returned to SICHMA upon its expiry. Subject to the approval of SICHMA only the labels/logos of SICHMA are to be used for the products certified by it as halal. The labels/logos are not to be used if the certificate has expired or if it has been withdrawn. SICHMA reserves the right to withdraw the Halal Certificate at any time if there is any breach of the conditions or guidelines, there is a change of ownership, the fee or any part thereof remains unpaid or at the expiry of the halal certificate. To ensure the success of the Halal Certification Program and for the mutual benefit of both parties, SICHMA ​​shall provide ongoing updates to the applicants’ business on changes in the halal industry.